Winston-Salem, N.C. offers a tremendous opportunity to centralize training operations for both cycling’s elite riders and rising stars. 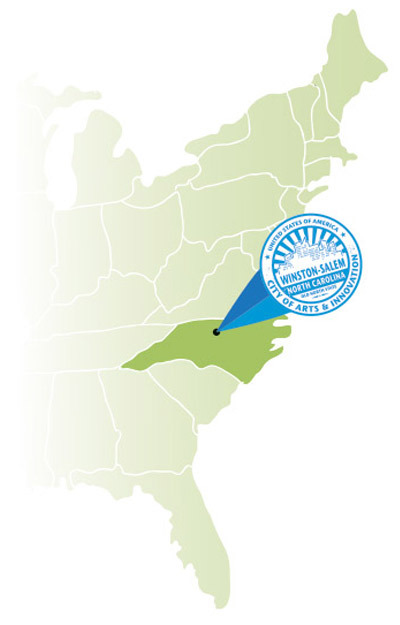 Our East Coast location and easy access to Europe, coupled with our great weather and varied terrain, make Winston-Salem an ideal area in which to build the NCC’s headquarters. The city itself has a population of just 230,000, making traffic easy and routes accessible. Riders can access lightly traveled two-lane rolling roads just outside the city. Significant climbs up Pilot Mountain (2.93 km at 9.2%), Hanging Rock and Sauratown Mountain lie within 20 miles. And the famous climbs of the Blue Ridge Parkway are just fifty miles to the North. World-class mountain biking trails are close-by at Hobby Park and Salem Lake, and the famous Kerr Scott trails are just 20 minutes away in Wilkesboro, N.C. In addition, Winston-Salem already hosts major cycling events that draw racers from around the world. The Winston-Salem Cycling Classic, held in the Spring following the Tour of California, is one of only two UCI licensed category 1.1 races in the US each year, and features both a road race and a criterium. The city will host the USA Cycling Professional road race and criterium national championships in both 2016 and 2017, as well as the USA Cycling Masters and Para-cycling national championships – the first city to ever host this many National Championship events simultaneously. Winston-Salem supports a thriving local cycling community, with more than 2,000 official club members and thousands more who ride on a recreational basis. This is a city that truly welcomes the sport. But that’s not all. Winston-Salem’s two research-level universities – Wake Forest University and Winston-Salem State University – feature extensive sports medicine and exercise physiology programs, providing a critical educational and health sciences component that will both be heavily involved in supporting the efforts and infrastructure of the National Cycling Center.